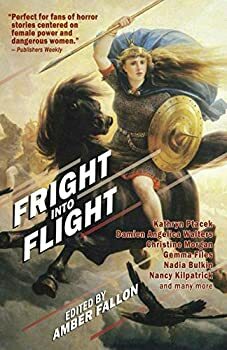 2018’s Fright into Flight anthology, edited by Amber Fallon, contains a collection of stories written by women. Theoretically, each story deals with flight, although that definition is broad. Because this was published by Word Horde, I expected a horror anthology, but several of these stories aren’t horror, and one is straight-up fantasy. All but one of the stories is a reprint. “I Did it for the Art” by Izzy Lee, is original to this volume. “The Floating Girls: A Documentary,” by Damien Angelica Walters. Written in “found-footage” structure, this story addresses a bizarre occurrence that happened twelve years ago, as the documentarian wrestles with her own sense of guilt over the loss of her childhood friend. “I Did it for the Art,” by Izzy Lee. A fashion photographer who lusts after young-teen girls is haunted by savage winged females. Are they real, or in his imagination? “Wilderness,” by Leticia Trent. Strange goings-on in a rural Maine airport bring out the primal fears of the waiting passengers. “The Silk Angel,” by Christine Morgan. On the home-front and in the air, the women and men of Britain struggle to survive World War One. One soldier begins to question the miraculous survival of some pilots — who used parachutes with a special addition. “Cargo,” by Desirina Boskovich. The crew of the space freighter Titania are already in trouble, hauling a deadly and illegal cargo, when their equipment starts failing. Fortunately, they happen upon a space derelict — but as we all know with spaceship horror, that’s never really a good thing. “Consent,” by Nancy Baker. Are horror writers responsible for what deranged people do after reading their books? For a particular horror writer, that question is life-and-death personal. “Bruja,” by Kathryn Ptacek. Like many others, Chato, a Native American who has trained as a shaman, is stranded at airport when all flights are delayed. Soon he’s in a supernatural fight for his life and that of the young pregnant woman he’s befriended. “I am No Longer,” by Nancy Kilpatrick. A paralyzed woman who has now lost everything plans her battle against a demonic parasite. “Faceless,” by Shannon Lawrence. Either the main character has the worst flight-anxiety ever imagined, or something is very, very wrong on her commercial flight to Atlanta. “Every Angel,” by Gemma Files. Darger, second-in-command to an urban crime-lord, fulfills his boss’s desire to capture a feral angel. But whose desire is truly being fed? “Cosmic Bruja,” by Leza Cantoral. A drug trip in Mexico opens the narrator’s eyes to her heritage and the nature of the universe. “With the Beating of their Wings,” by Martel Sardina, is a vivid atmospheric exploration of life after death, and the nature of reincarnation. “Deathside,” by Allyson Bird. On a colony starship contaminated with a killer virus, one man struggles to save the souls of the dying from a dark spiritual entity. “Thlush-a-Lum,” by Rebecca Gomez Farrell. Markell hears things others don’t, including the thulsh-a-lum of leathery wings outside her attic-bedroom window. Soon, she discovers what they mean. “The Fallen,” by Pamela Jeffs. An android whose mission is to scour a tainted earth for any sign of human habitation instead tries to bring an android companion to life. “When She was Bad,” by Nadia Bulkin. The “final girl” (the one who survives to the end of the horror movie or is at least the last to die) plans revenge on the winged monster who killed her friends. “The Silk Angel” is a straight-up fantasy, and maybe not even that; it could be described as an urban legend or a war story. It’s war between Germany and Britain, and Augustus Pearce is sent up in a hot-air balloon to observe and report on the dogfight between the two forces. The balloons have no defenses and it is dangerous work, and soon Augustus’s ride is a casualty. His commanding officer orders him to parachute to safety, and he does, but it seems that safety is impossible. The story shifts to England where Paul Elliott, whose bad leg kept him from the war, returns home to inspect the family factory his wife Sarah has been running in his absence. Things are going very well indeed, as the women Sarah has hired sew parachutes for the war effort. The demand will be increasing since now the military had added parachutes to airplanes, not just balloons. Paul is shocked to see an extremely old woman working. When he confronts Sarah, she says that the old woman asked for a job; she walks four miles to and from the factory to her home, which is a shack, and Sarah believes that the hot lunch she serves is the woman’s one meal a day. The elderly lady provides quality control for the ‘chutes. At first shocked and even a bit angry, Paul actually builds on his wife’s kindness to the old woman. Still later, Augustus is seen interviewing air crew members who parachuted out and survived nearly impossible odds. World War One is far enough in the past now that it’s suitable for fantasy, and this story excels in small details, and showing the struggles of the women back home, as well as the battlefield. “Wilderness” is a direct descendant of Shirley Jackson’s “The Lottery.” It would not exist without that story, without the Massachusetts Bay Colony witch-craze of the 17th century… or without Stephen King. Krista’s flight to New Haven is delayed, with no reason given, but Krista has been observing the airport workers and police, and she is nervous. There’s something they’re not saying. Krista is an observant loner who recently lost her job. She notes the passengers around her in detail. More police show up, and more and more restrictions are put on the waiting passengers… with no answers. Krista goes outside for a walk, but the police haul her back in. It seems like there might be something toxic in the air, or maybe in the water. As they wait, and things grow stranger, the passengers turn on each other. The pacing of the story is perfect, even if Krista is implausibly introverted and passive. I liked the atmosphere of this one, nicely foreshadowed by the cover of the book Krista is reading. “Every Angel” is a standout for the prose and its perfectly captured narrative voice. Bob is a brutal low-level crime boss and Darger is his right-hand man. When rumors swirl of a feral angel down under a nearby freeway overpass, Darger is sent to explore. There is a winged thing living down there — a human-looking, carnivorous thing. Bob wants it captured and Darger complies, at great personal risk. The story embodies the adage “be careful what you wish for,” as the angel is not what she seems. I liked “With the Beating of Their Wings” because it was a thoughtful and vividly-written model of reincarnation. The first-person narrator begins his story shortly after his death, as the cutters prepare his body so that his spirit can move on. We follow his awareness through a flock of vultures into his next life. The story is quiet and dark, not particularly frightening. Twelve years ago, all over the world, girls, 300,000 of them, floated up into the sky and vanished. All over the world, this phenomenon was hushed up. This is the premise of “The Floating Girls: a Documentary.” Our documentarian, Tracy Richardson, intersperses film and audio from her “documentary” with her personal memories of her next-door neighbor and best friend Jessie. Jessie’s father died when she was eight and soon after her mother remarried. After that, Jessie was more and more isolated and didn’t visit Tracy, and the two grew apart. Jessie is a floating girl, and part of Tracy’s drive to study the phenomenon is based on her guilt that she didn’t do more to help Jessie out of her situation. The mechanics of the disappearances, or why there has been only one incident, is not explained. The story of Tracy’s guilt is well-done, and the imagery is striking. “Cargo,” originally appeared in Ride the Star Wind: Cthulhu, Space Opera, and the Cosmic Weird, which proves once again that there is an anthology for everything. The only “flight” in the story is the interstellar kind. The Big Evil the crew meets is convincingly creepy and shivery, and the tensions among the crew before they board a ship are well-drawn. A couple of these works read more as vignettes than fully-developed stories to me. “Cosmic Bruja” could almost be memoir, a narrator recounting her connection to the land of her birth (Mexico), her experience with LSD and subsequent insights into the nature of life. There isn’t any real conflict, but the writing is lovely. “Thlush-a-lum,” while also touched with beautiful, concrete details, doesn’t really have a plot arc. The most elastic definition of “flight” is probably given to the story “Consent.” What is the purpose of horror writing? Are writers or artists responsible for what an individual does who claims to be inspired by their work? Does depiction connote approval? These are artistic and first-amendment questions which “Consent” does not answer, choosing instead to follow a slasher-type plotline. A best-selling horror writer was cited as the inspiration for a serial torture-killer, and now the lone, mutilated survivor of that killer takes her revenge against the writer. The story takes place at an airport in a deserted hangar, but that could have been nearly any isolated location, and the only element of “flight” is that the woman plans to fly away on a private jet. I read an ARC of Fright into Flight. I mentioned that all but one of these were reprints. While most of the anthology’s stories are recent (very recent, like 2017), some date back to the 1990s. I assume that the final book will have an introduction or author forward, which might address the differences in a pre-September 11th story. For me, the story “Bruja” in particular was jarring, as the main character, who has just stepped off an airplane, reaches for his Swiss Army knife. Of course, before the attack on the World Trade Towers, security was much more relaxed. As I said, the book casts a wide net in defining “flight,” which leads to a good variety; horror, fantasy, dark fantasy and science-fiction horror. Fright into Flight is not my favorite of the Word Horde anthologies, but there are some gems, and certainly it introduced me to some writers to watch for. Published in September 2018. From the earliest depictions of winged goddesses to the delicate, paperwinged fairies of the Victorians, from valiant Valkyries to cliff-dwelling harpies, from record-setting pilots to fearless astronauts, women have long since claimed their place in the skies, among the clouds and beyond. Word Horde presents Fright Into Flight, the debut anthology from Amber Fallon (The Terminal, The Warblers), in which women take wing. In these stories connected by the unifying thread of flight, authors including Damien Angelica Walters, Christine Morgan, and Nadia Bulkin have spread their wings and created terrifying visions of real life angels, mystical journeys, and the demons that lurk inside us all. Whether you like your horror quiet and chilling or more in-your-face and terrifying, there’s something here for every horror fan to enjoy. You’re in for a bumpy ride… So fasten your seatbelt, take note of the emergency exits, hold on to your airsick bag, and remember that this book may be used as a flotation device in the event of a crash landing.